This rug is entirely handmade, from the spinning of the yarns to the weaving on the loom. It is unique, and has been crafted by weavers in the Kathmandu area, whose skills have been passed down through many generations. We use only the finest natural yarns; the Tibetan wool is renowned for its softness and durability, while the fine silk brings a delicate lustre that enhances the design of the rug. To this we have added the vision of a world class designer, and the result is a hand knotted contemporary rug of extraordinary beauty which will itself become an heirloom to be treasured for years to come. Inspired by raw, painterly silhouettes, the graceful imperfections and idiosyncrasies of this hand-painted designs possess so much soul. This pattern has a sense of depth and movement highlighted by a subdued, tonal color palette. It makes a quiet statement while adding dimension and spirit to any space. Composed of Tibetan wool and silk. With it’s curvilinear form, bold massing, and thoughtful detailing, the Souffle Chair is a modern icon. 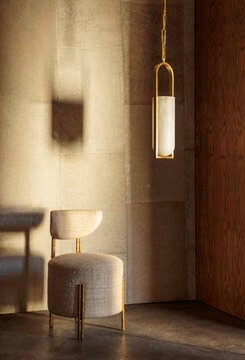 This chair features solid cast burnished brass legs and an artisanal ruched leather body which is available in a curated selection of leathers. Non-ruched options are also available. The classic hand-sculpted fluted marble vase is an elegant and dramatic piece to hold fresh flowers or stand alone piece. This solid marble vase is available in two sizes.